Bus 112 from Kovan MRT Exit B. Alight at B05 stop, Hougang Ave 2. (5 bus stops excluding Kovan MRT), approx 7 mins. Bus 55 from Bishan Interchange. Alight opposite Blk 627, Hougang Ave 2. (15 Stops). Bus 25 from Ang Mo Kio Interchange. Alight in front of Blk 627, Hougang Ave 2. (11 stops). 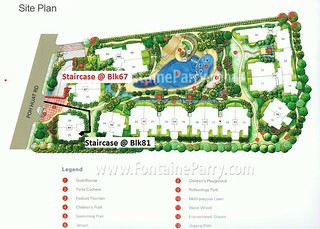 Ref map, the path leading from the bus stop to Fontaine Parry is called Park Villas Terrace. CTE exit AMK Ave 3 - right into Yio Chu Kang Rd - left into Poh Huat rd. Parking due to limited lots, pls be advised to park along Poh Huat Rd. Walking - Walking 14 mins from Kovan MRT Exit B. Once you reach premise take the staircase down to basement (press 526 + bell) to take the lift up to 5th floor. Is this a sharing on upcoming trip or showcase of travel photos about the trip? Hi, its a sharing & slide show.